Delhi Shocking Incident came into light on July 1 Sunday Morning, Reported 11 Family Members were Found dead and according to the Source. The Family owned and ran a grocery shop and Plywood Business out of their house in Sant Nagar Burari area in North Delhi. their shop always opens by 6 am every morning but today it didn’t open till 7 am. One of their neighbour informed the Police when he not found open their shop and later went to check at their home and found all them hanging from the roof grill. 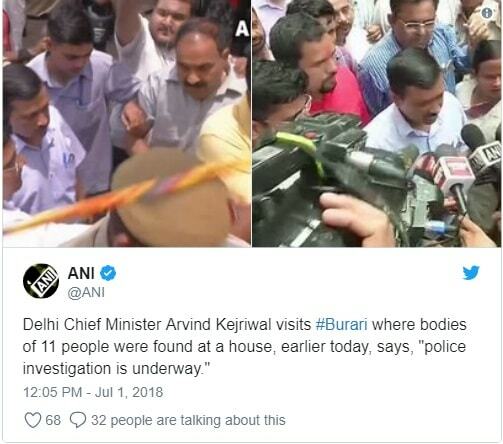 Delhi Chief Minister Mr. Arvind Kejriwal had Visited at the incident site after got the shocking news and said, Police Investigating is going on. at least 11 dead bodies were found hanging in a house in Burari. Dead bodies have now been identified including 75-year-old Narayan and his two daughters namedPartibha and Priyanka aged 60 and 30 years respectively. Narayan’s son Bhupi, 46 years old and his wife Sawita 42 years old. Bhupi’s three children including two daughters and son aged 24, 22 and 12 years respectively were all found hanging. Narayan’s other son Lalit aged 42 was also found dead along with his wife Tina, aged 38 years and son Dhiru aged 12 years.